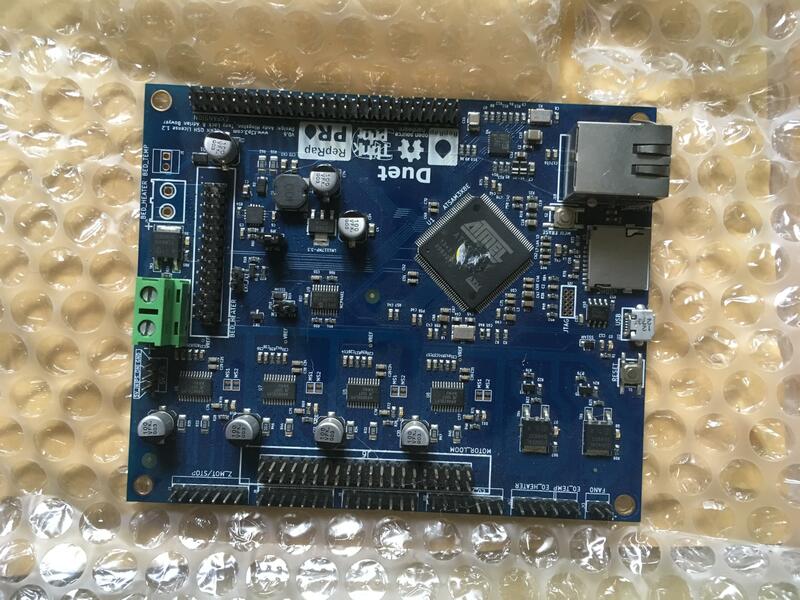 Having difficulty creating a card the second–hand, ebay–acquired board will read; is there anywhere I can acquire one guaranteed readable? You would be better off installing more recent firmware, which will give you better diagnostics. Unfortunately, bossa refuses to connect to the board on 3 separate platforms; Linux, Mac and Windows. Arduino IDE on Mac let me run the M115 which told me the firmware version, and that a G28 X0 returned: Can't open 0:/sys/homex.g not found. I have been unable to backup current obsolete firware, nevermind install the latest for a Duet 0.6. What's the full command you are using to get bossa to update it? Terminal or GUI? There were some guides kicking about that neglected specifying the com port number. Not sure if you need to erase before uploading with bossa? I expect I should be trying a different capacity/class microSD card. Any card up to 32Gb should work, provided it is formatted to FAT16 or FAT32 (which SD cards in that capacity range normally are). Can you post a close up photo of the back of the SD card socket? Older Duets sometimes have bad soldered connections there. Macro file homex.g not found. Will take a close-up when next in the same room as the board. That looks OK, but you need to look at it from just above the main processor. Sometimes it's evident that the pins on the right hand (as seen from that angle - it's the left hand end in your photo above) end of the row are just sitting on the PCB pads instead of being soldered to them. Is the SD card pushed into the socket far enough so that it clicks, and you have to push it again to release it? I try to seat the card properly; have used canned air to blow out to no effect. I can't be certain because that part of the photo is a little out of focus; but the joints look OK to me. It's usually clear when the joints are bad. If the joints at the back of the SD card are bad, it's easier to mend them using a no-clean flux pen and a fine-tipped soldering iron than with hot air. The other likely possibilities are a bad or damaged contact in the socket, a damaged processor, or a bad soldered joint on one of the processor pins that connects to the SD card. Or just possibly a short (solder bridge) between 2 processor pins, but that's less likely. Have you tried to reading the files on your computer? Have you checked the file system matches what is expected? The duet maybe case sensitive. That's a long way from me (Somerset). @doctrucker the Duet seems unable to read any microSD cards presently. Have replaced the microSD socket; the problem persists. If the Duet used to be able to read SD cards, then sadly the most likely reason it won't now is that one of the microcontroller interface pins is no longer working. It's possible to replace the microcontroller, but not easy. I wrote off the first two Duets that I tried to replace the microcontroller on, by lifting PCB traces. The 3rd and 4th I did successfully.